Just like a white-winged dove… robot. 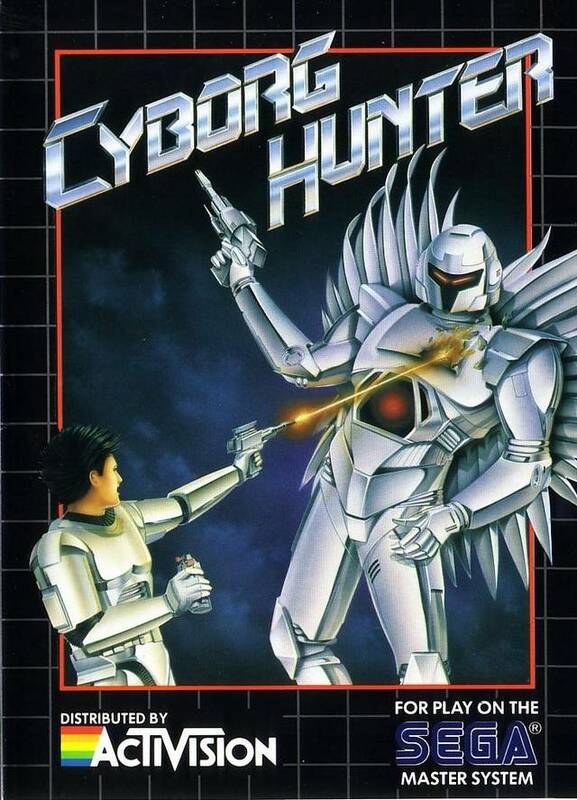 In Cyborg Hunter, you play as Paladin, a bounty hunter who bears a suspicious (but totally coincidental) resemblance to Robocop. Paladin’s purpose is to take out the Cyborg army, led by a vicious scag named Vipron. 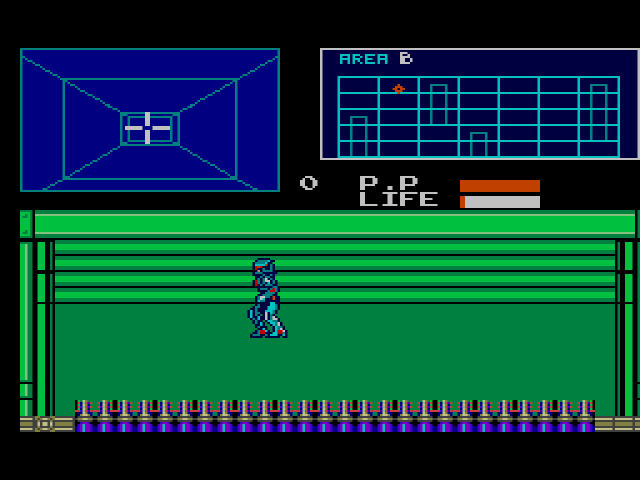 The Cyborg Fortress is where the game takes place. When you first start, Areas A through G are displayed at the top of the screen. Each area counts as one stage, though within each area are five levels that you access via elevators. 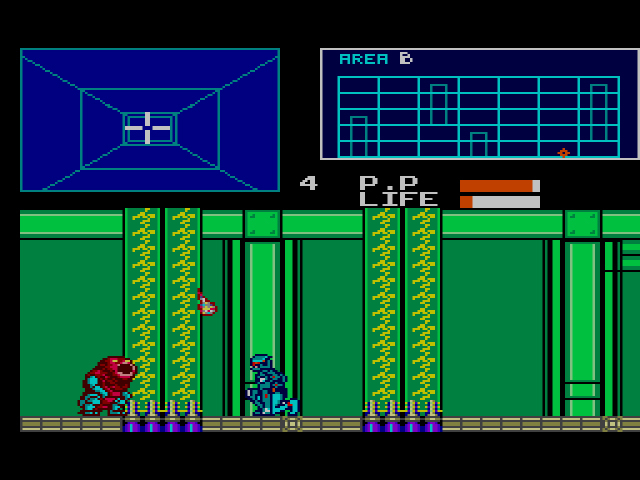 Each level is a hallway consisting of Lower Cyborgs, the grunts of the Cyborg army, and the occasional Chief Cyborg. The Lower Cyborgs take little effort to deactivate, but the Chief Cyborgs require a stray bit of thought. Take out the Chief Cyborgs (you’ll know where they are by that obnoxious beeping), collect any important items along the way (they’re all important – collect ’em all! ), and move on from the Area. Samus had some time to kill between Metroid and Metroid II. Starting from Area C, you’ll also have to fight Cyborg bosses. These bosses are smart, agile, and fast, the kind of robots you don’t want to become self-aware. Thankfully, by the time you’ve reached Area C, you’ve already amassed a full-blown arsenal. In addition to a punch and a Psycho Punch which spews out a limited-range projectile, Paladin also has a Laser Gun. The Laser Gun is a little on the weak side, but it’s long range. In Area D, you’ll get the Psycho Gun. This one’s for serious bounty hunters: it’s the strongest weapon in the game. You also have timed bombs; if they hit, they’ll take off a significant chunk of damage. In addition to weapons, you also acquire a shield which protects you from laser beams and a jet engine which allows you to fly. The jet engine would be cooler if all of the enemies didn’t hop like mad mecha jackrabbits right into Paladin’s grill, but you can use it to fly over beds of spikes and such. You can float if you want to. You can leave your cares behind. Cyborg Hunter has a particularly obnoxious flaw. The regular controls – moving, shooting, jumping, entering elevators – work really well. But to get into your menu, you have to press Button II on the second control pad. This menu allows you to switch between weapons and turn your jet engine on and off, so you will need to access it a lot, particularly as you get further in the game. So why did Sega force this upon us? The short answer is, they ran out of buttons. Perhaps if Sega had thought to include a start button on the controller instead of on the console itself? Oh, and if you don’t have two control pads – say you bought a used system with one controller – you’ll have to switch your controllers back between ports any time you want to open the menu. These hall monitors are the worst. This flaw aside, Cyborg Hunter‘s repetitious back-and-forth is curiously addictive. 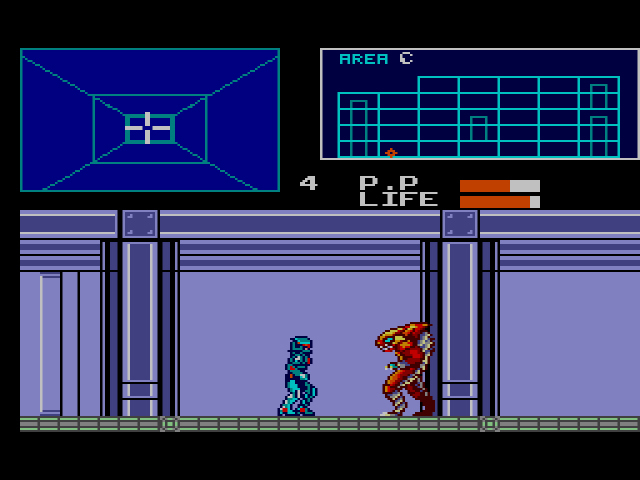 The gameplay is reminiscent of Zillion II‘s platforming segments, only more enjoyable: you move from one hallway to the next, kill enemies, go up an elevator to the next level, kill more enemies, and so on. Sounds tedious, but the game has a steady pace that drives you to get a little bit further each time. Life is scarce. You have one life, no continues (there’s only one Life power-up in the first three levels), so learn the enemy attack/movement patterns and make precise hits if you want to get far. Get to Area G, the last stage, and consider yourself a true G. Also, the propulsive music sounds as close to Mega Man as anything you’ll hear on the Master System; if nothing else, play the game to hear some quality tunes. Well, at least this little shrimp is just being true to himself. Cyborg Hunter resembles a walking simulator with the occasional fisticuff upon first play. Elevators, bland hallways, and cyborgs, bloody cyborgs are all you’ll encounter, but the desire to stay alive and see what lies in the later Areas keeps you moving. 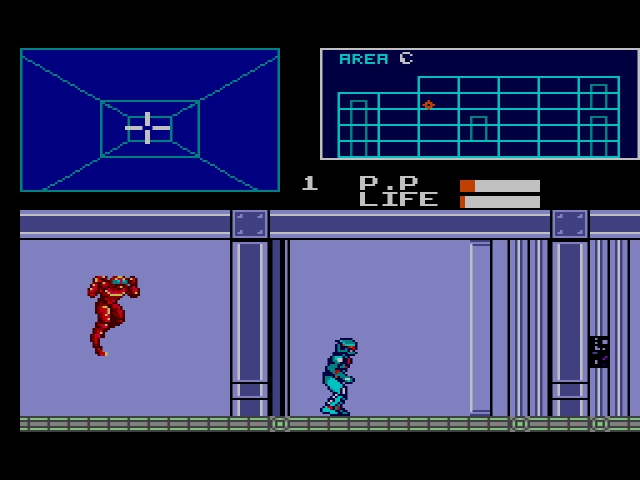 – Cyborg Hunter was published by Activision in America, and is the first example of a third-party publisher releasing a game on the Master System. Activision was one of only two third-party publishers for the Master System (Parker Brothers was the other one), and while it’s unclear why they chose Cyborg Hunter to publish out of all titles, it’s good to see another company lending Sega a hand. – Cyborg Hunter is based around a science fiction anime named “Sonic Soldier Borgman” that debuted in 1988 in Japan. Outside of the enclosed link, there’s very little info to be found about the show in English. 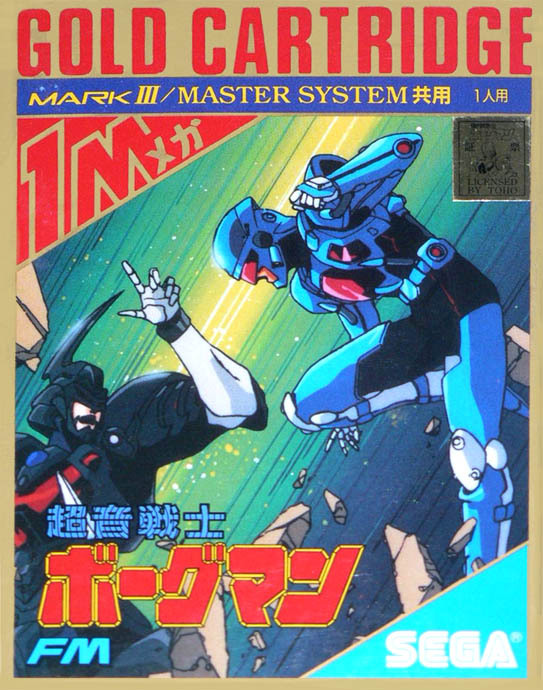 Since the show never left Japan, Sega changed Cyborg Hunter‘s story and characters for the European and American release. That sounds horrible ! Surely pressing pause on the console would be better work around than that. Never tried this game, sounds up my alley top review as always Dylan. I agree with your review Dylan. This is a nice little game. I didn’t have this one as a kid so I don’t have much nostalgia with it. I picked it up on eBay a few years ago and I was pleasantly surprised. It should probably be noted that the box art is “totally rad” by 1989 Sega standards. The controller 2 option menu is pretty bizarre but necessary considering what they had to work with. My little brother would have loved being the controller 2 operator instead of just watching me play games all the time. Good point about the little sibling aspect, ET. I’m an only child, so I naturally don’t think about having siblings. Having a youngling man the second controller would be the best way to open the menu. Every Master System released in the US came with 2 controllers (with the exception of the Master System 2, which had not been released yet), so your complaint about having to buy a second one isn’t valid. I suppose if you bought a used console with only one controller (as I did), it could be a concern. But your point is well taken, and I will amend the review. I stand by my original argument that having to use a second controller to access the menu is annoying as crap. Another two controller SMS game just to bring up a menu. As much as I am a fan of the SMS even I admit the controller and the console would have done well with a SELECT button. Also that western box art is suspiciously similar to Mega Drive/SMS boxes. Thats confusing. Well this came out I’d like to say at least a year before the Genesis in the U.S. That it looks like a Genesis box is purely coincidence. It’s an Activision thing really.